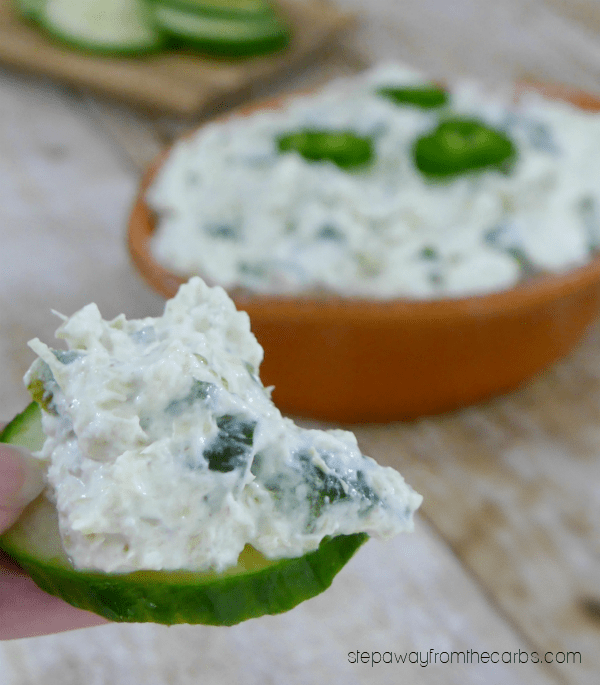 This spicy poblano and artichoke dip is perfect for serving as an appetizer or as a game day snack! Low carb, keto, and LCHF recipe. I was recently at a new-to-me farmer’s market – you may remember it from when I posted my low carb Redcurrant Muffins! One of the stalls was selling homemade dips, and I saw one that was poblano, spinach, and artichoke. It sounded fantastic, and I nearly bought some. But then I remembered that I had a couple of poblanos left over from making my Turkey Enchilada Stuffed Poblanos and I just knew that I had to make my own. I didn’t have any spinach to hand but I had everything else in stock. 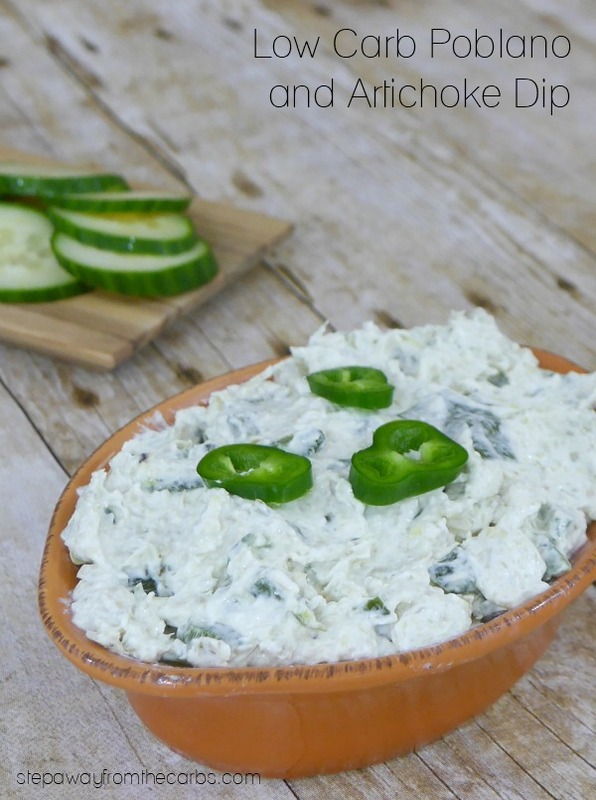 This recipe is adapted from my Blue Cheese, Spinach and Artichoke Dip – so if you love this, try that next! To prepare the poblanos, use tongs to roast the skin of the whole poblanos over an open flame (like a gas stove top or hob), turning the peppers until the skin is blistered all over. 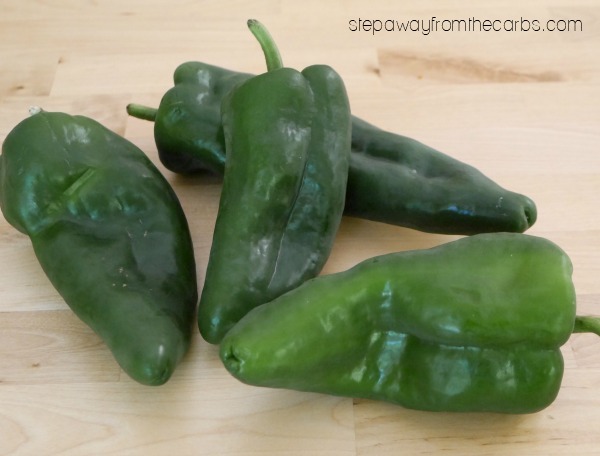 Once blistered, place each poblano in a plastic bag, and let steam for 15 minutes. Use a dinner knife or similar to scrape off the charred skin of the peppers, then remove the stalk and seeds, and roughly chop. Once the poblanos are ready, combine cream cheese, sour cream, and a drained can of artichokes together in a food processor. You can make it super smooth or leave a little artichoke texture, whichever you prefer. Add in the poblanos, and pulse a few times. Check for seasoning and add salt and pepper as necessary, then stir to mix. Transfer to a serving bowl. 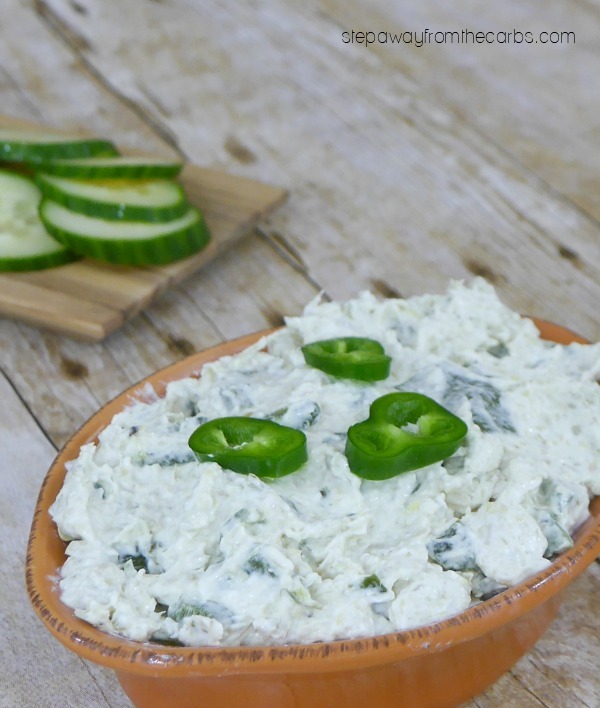 Depending on the heat from your poblanos and the palates of your guests, you might like to decorate it with a few slices of jalapeño to indicate that this dip has a kick to it! 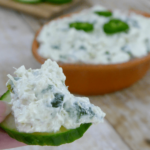 I served this dip cold, with slices of cucumber, but actually, if you preferred a warm dip, I’m sure it would also work well! Just place under a hot broiler for a few minutes until it is bubbling! Also, I’ve called it a dip but a few days ago I actually dolloped a large spoonful of it onto some steak and it was fantastic! 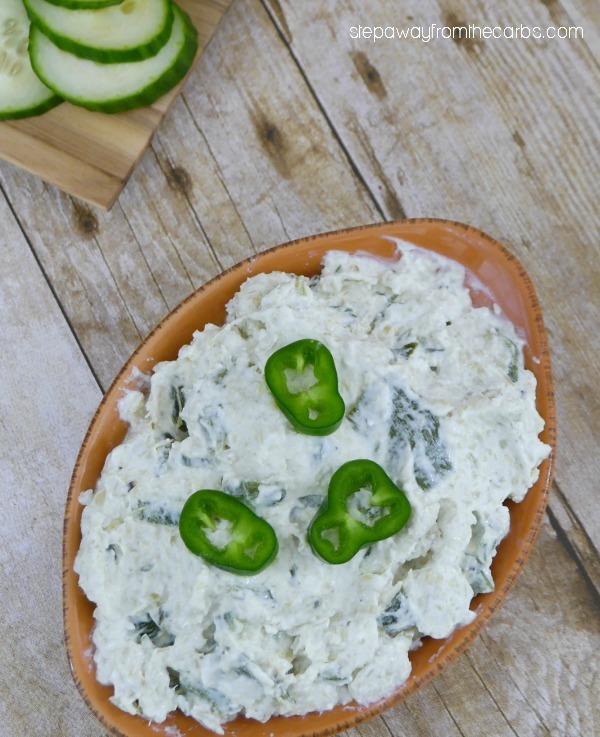 This spicy poblano and artichoke dip can be served as an appetizer, snack, or at a party! 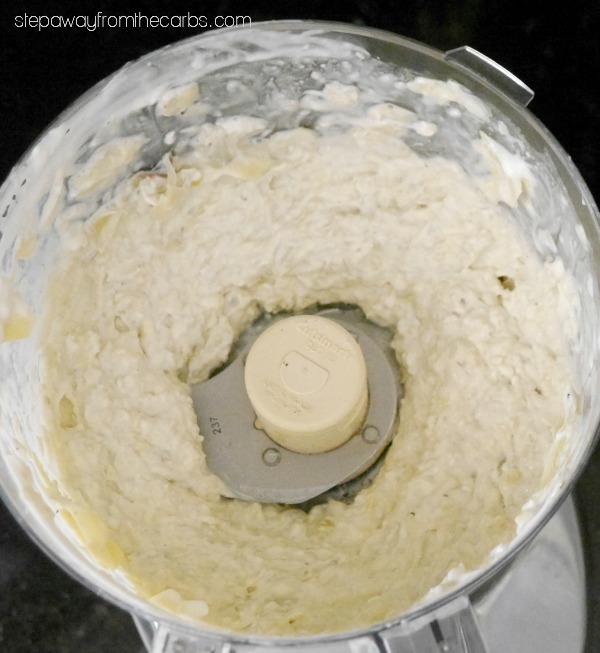 Combine cream cheese, sour cream, and artichokes together in a food processor. Check out my Low Carb Chips & Dips Ebook! Do you love chips and dips? 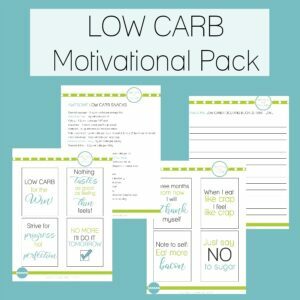 Check out my mini ebook for more low carb recipes!